Subtitle: Nitric oxide in hemostatic and bleeding mechanisms. Part II. Summary: This is the second of a coagulation series on PharmaceuticalIntelligence(wordpress.com) treating the diverse effects of NO on platelets, the coagulation cascade, and protein-membrane interactions with low flow states, local and systemic inflammatory disease, oxidative stress, and hematologic disorders. 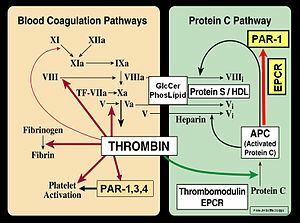 It is highly complex as the distinction between intrinsic and extrinsic pathways become blurred as a result of endothelial shear stress, distinctly different than penetrating or traumatic injury. In addition, other factors that come into play are also considered. Please refer to Part I. Part II has explored organ system abnormalities that are all related to impairment of the Nitric Oxide balance and dual platelet-endothelial roles. Figure 1 (A) shows normal red blood cells flowing freely through veins. The inset shows a cross section of a normal red blood cell with normal hemoglobin. 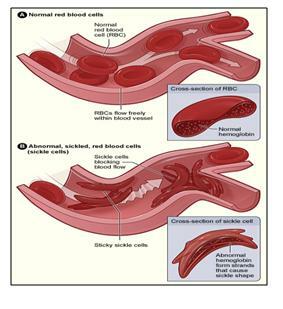 Figure 1 (B) shows abnormal, sickled red blood cells The inset image shows a cross-section of a sickle cell with long polymerized HbS strands stretching and distorting the cell shape. 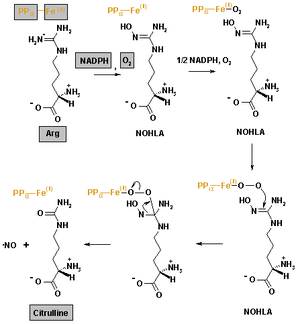 As to “a quantitative relationship between cell free Hb and depletion of NO”, Deonikar and Kavdia (J. Appl. Physiol., 2012) addressed this question by developing a model of a single idealized arteriole, with different layers of blood vessels diffusing nutrients to tissue layers (Figure 2: Deonikar and Kavdia Figure 1). The model and its parameters are explained in the previously published paper by same authors Deonikar and Kavdia, Annals of Biomed., 2010, who reported that the reaction rate between NO and RBC is 0.2 x 105, M-1 s-1 than 1.4 x 105, M-1 s-1 as previously reported by Butler et.al., Biochim. Biophys. Acta, 1998. Their results show that even small increase in cell free Hb, 0.5uM, can decrease NO concentrations by 3-7 fold. Their mathematical analysis shows that the increase in diffusion resistance of NO from vascular lumen to cell free zone has no effect on NO distribution and concentration with available levels of cell free Hb. Deonikar and Kavdia’s model, a simple representation shows that for SC disease patients, decrease in levels of bioavailable NO is attributed to cell free Hb, which is in abundant for these patients. Their results show that small increase by 0.5 uM in cell free Hb can cause a large decrease in NO concentrations.